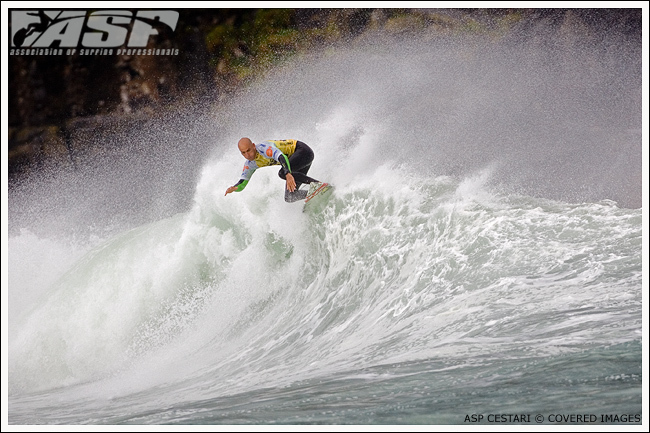 Friday, Oct. 3, 2008: Kelly Slater, 36, has won a record ninth ASP World Title after advancing out of Round 3 of the Billabong Pro Mundaka – the ninth event of 11 on the 2008 ASP World Tour. Slater came into the event needing an equal ninth finish to clinch the title, he secured that by beating local wildcard Eneko Acero (EUK) in four foot waves at Mundaka this morning. Slater’s 2008 crowning comes 16 years after securing his first ASP World Title at age 20. He is the oldest and youngest surfer in ASP history to win a world title. 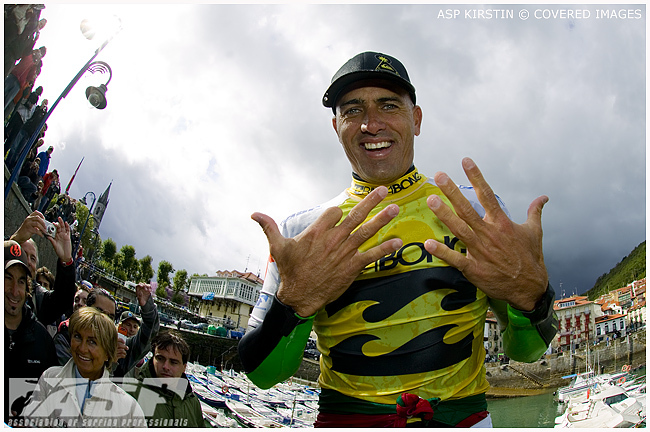 The now nine-time ASP World Champion joined the tour in 1991 and won his first ASP World Title in 1992. When asked if he had ever dreamed about achieving such a feat when he came onto the scene 17 years ago, Slater was close to speechless. Despite entering his 14th year on tour already the owner of most every accolade in professional surfing, 2008 has been a banner year for Slater. With five wins in the first seven events of the year, a second place finish at the last event in France and a Round 4 berth at the Billabong Pro Mundaka later today, Slater is on track to post his most successful season to date. Slater’s winning average in 2008 is 89 percent at present. After winning his first ASP World Tour title in 1992 and claiming five titles in a row from 1994 to 1998, Slater went into semi-retirement at age 26 citing burnout and lack of motivation. He returned to the tour full-time in 2003, lost a heart-wrenching title race to Andy Irons (HAW) that same year, and wasn’t able to reclaim the crown until 2005. Slater cruised to title No. 8 in 2006, finished World No. 3 in 2007 and is once again World No. 1 after winning his ninth ASP World Title today. With such a monumental lead so early in the season, it was less a matter of if Slater would win the title, and more a matter of when. Slater was quick to acknowledge 2007 ASP World Champion Mick Fanning (AUS) and the support he’s given him both professionally and personally today. Because Slater lost interest after winning five titles in a row from ’94 to ’98, and then toyed with retirement again after winning No. 7 and No. 8 right after each other, it would seem like winning back to back titles might have lost its appeal for the world’s most decorated surfer. For Kelly Slater’s complete biography and career details visit www.aspworldtour.com/kellyslater. It’s all LIVE on www.aspworldtour.com and www.billabongpro.com.